Welcome to Hooked on Cycling Holidays and our cycling holidays in Switzerland. This particular biking vacation in Switzerland starts and finishes in Zurich making for very easy access and departure. This cycle tour is a level 2 self guided bike tour. On this cycling tour you will experience the wonderful highlights of Switzerland, the cities of Zurich, Bern and Lucerne, many pretty lakes and the stunning cultural highlights like the cloister of Einsiedeln. The city on the lake of the same name is seen as being the only metropolis in Switzerland and has a well preserved old town. All visitor attractions can be found within walking distance in and around the old town, e.g. stained glass windows by Marc Chagall in the Fraumünster- Kirche. Today is a day of wonderful lake cycling. 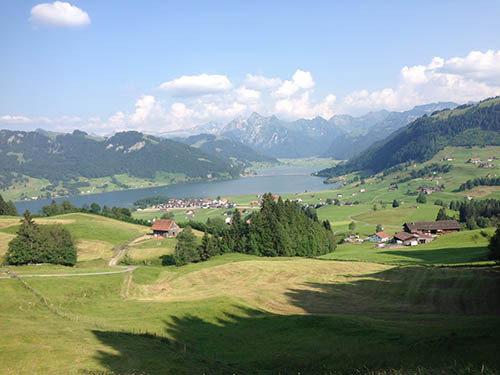 Today’s cycling will be through quiet countryside and lively villages as you pass Lake Ägeri and Lake Zug. Küssnacht, Wilhelm Tell and Hohle Gasse are all Swiss national symbols which you will see today before cycling along Lake Lucerne and reaching the city of Lucerne. The mountains to the left and right of Lake Sarner and Lake Lungerer continue to get higher. You will take the train to get over the famous Brüning mountain pass. Passing Lake Brienz you will reach your destination, the spa town of Interlaken between Lake Brienz and Lake Thun. Interlaken is also famous as an outdoor activity heaven! The day begins with a boat trip on Lake Thun before you cycle on to Bern. Goethe thought Bern was the most beautiful city in Switzerland. The old town is a world heritage site. Cycling along the Aare river and Lake Wohlen you will come to the bilingual town of Biel/Bienne. The Swiss watchmaking industry made the town famous. In the Omega museum, you can learn all about the industry. The river landscape of the, by now large, Aare dominates the landscape today. Villages and meadows lie along the route to Aarau, which is still marked by the 16th Century and was once the capital town of the Helvetic Republic. Following the Aare River, you will come to the “Wasserschloss” of Switzerland which literally translated means the “Water Castle”. You will cycle back to Zurich through the spa town of Baden with its 19 thermal springs. After breakfast, your cycling tour of Switzerland comes to an end. PLEASE NOTE: A couple of days are slightly hillier than the rest, however overall the tour is a level two (2). The cycling tour has some dedicated cycle paths, bike lanes on roads and quiet side roads. There are some inclines and a few sections where you may have to push your bike (depending on your level of fitness).